Should it P-Interest You? | A little of this. A little of that. My kids are always begging me to paint. I hate paint. It makes such a mess and everything ends up covered in it. Walls, tables, chairs, floors, kids…..so when I saw this idea, I really wanted to try it. 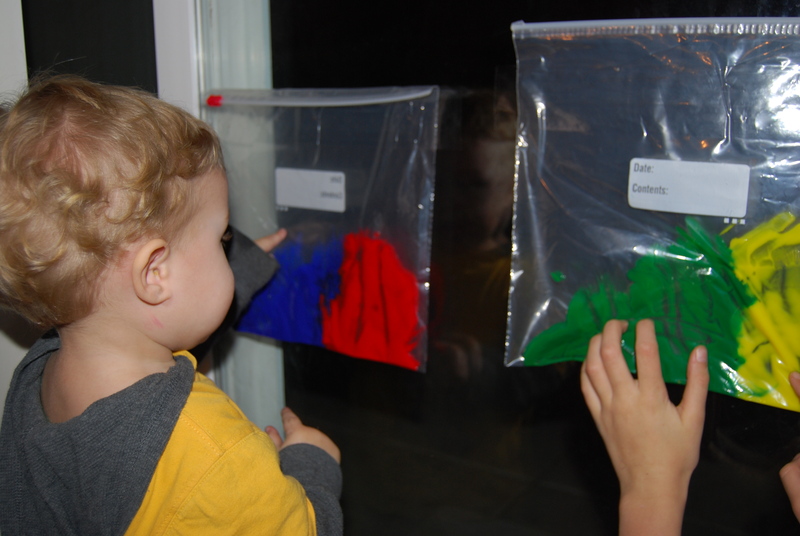 You only need 3 things: finger paint, a ziploc bag, and tape. 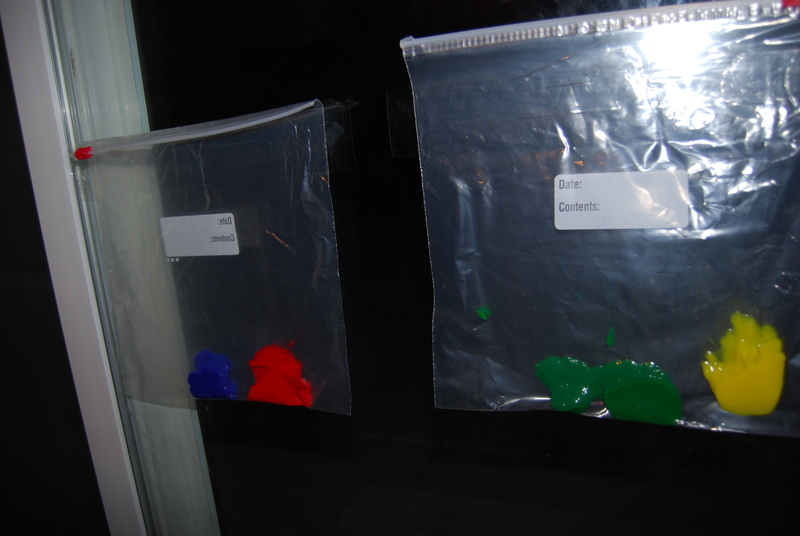 Put some blobs of paint in a Ziploc bag. 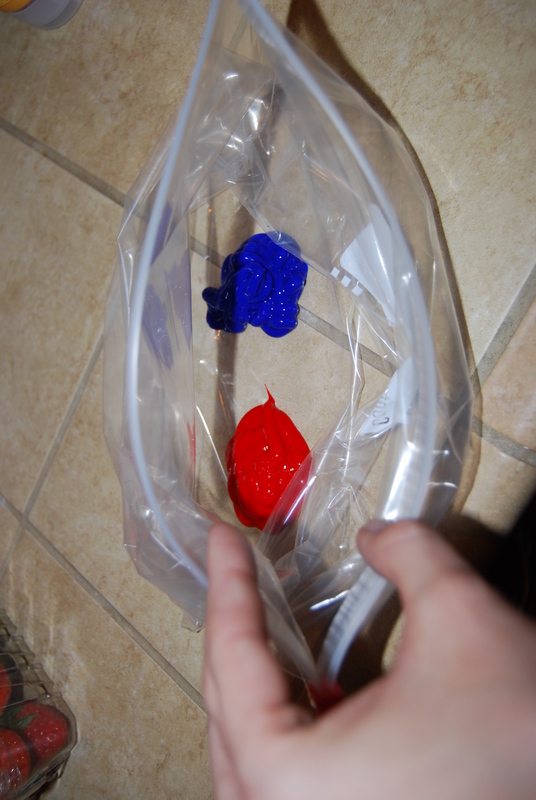 I put two colors in each bag to make it interesting. Then you tape them to a window or a glass door. 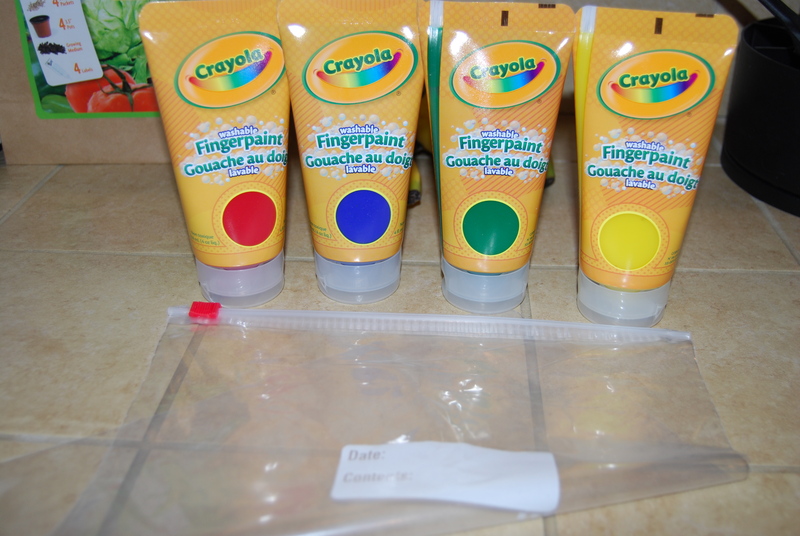 And the kids can finger paint all they want, with no mess! And it last for days! Ours has been up for 4 days and it’s still usable. My kids are 11, 7, and 20 months and they all love it! I’ve even played with it 🙂 And the cleanup is so easy. Just pull it off and toss it in the trash. With three kids and two dogs always running in and out and a husband who is always tracking in dirt and grease from the garage, I love my Swiffer Wet-Jet. But, I don’t like paying almost $6 every time I need a refill. 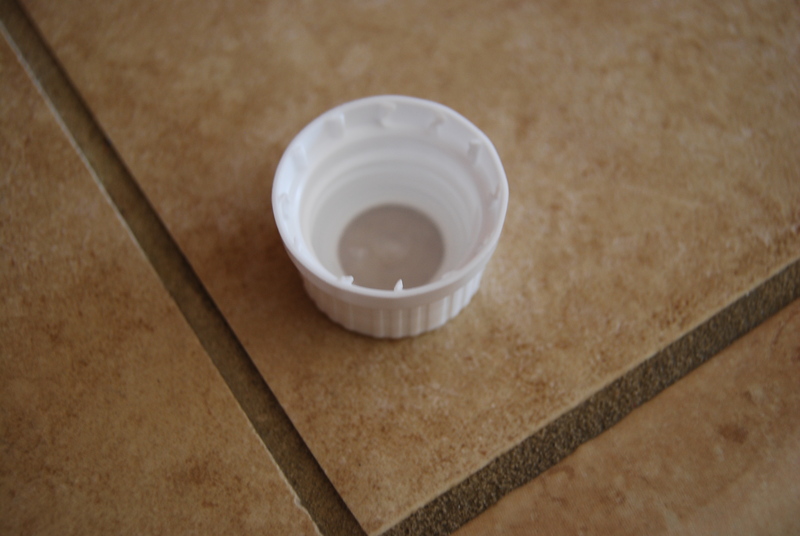 I don’t know if you’ve ever tried to remove the lid, but it seems like it can’t be done. 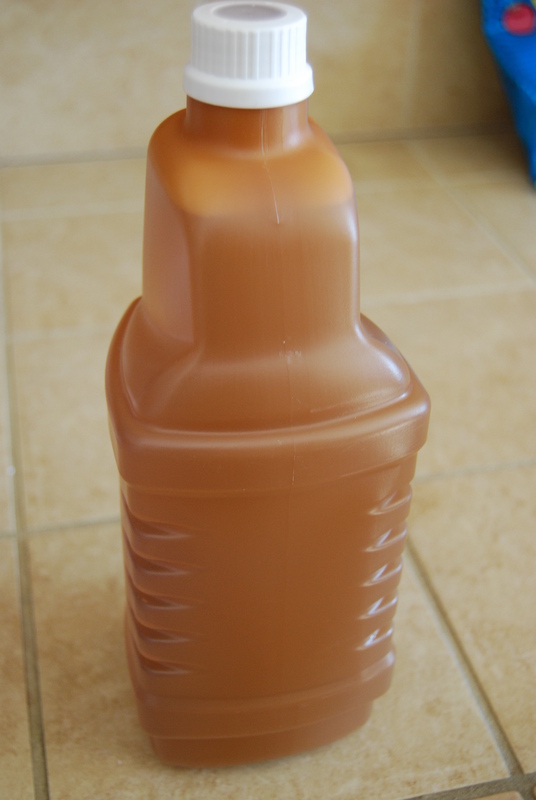 I did some searching and I found a way to refill my bottle and save a little money. You need an empty bottle to start with. 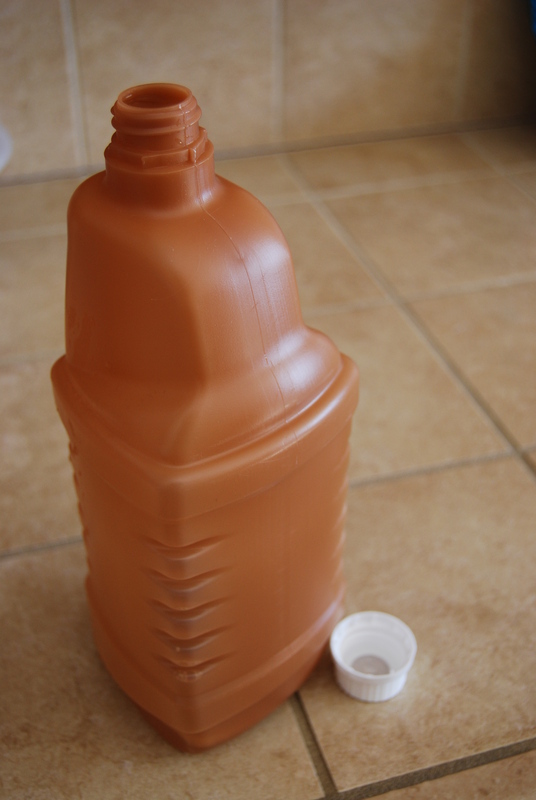 Fill a small pot with water, just enough to cover the lid of the bottle. Bring it to a boil. Dip the lid into the water. Let it sit for about 30-60 seconds. The lid will come right off! 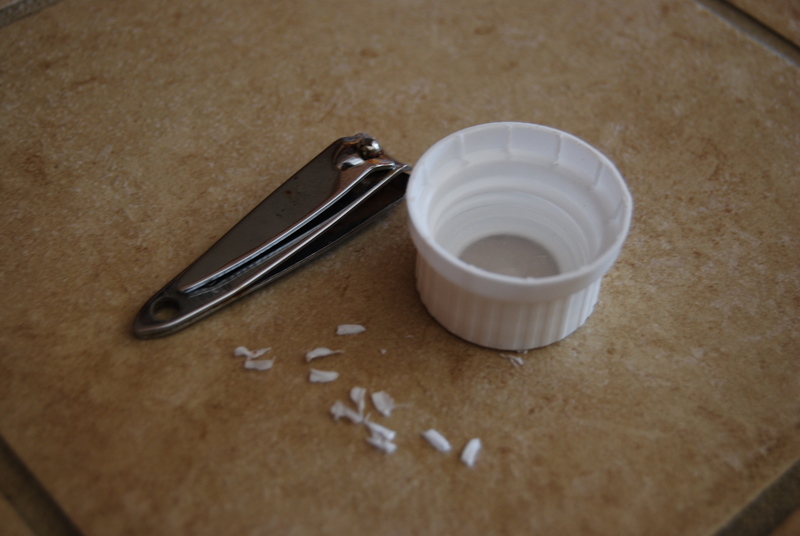 I’m not sure if you can see in the picture, but the lid has tiny plastic pieces that keep you from just taking it off. So grab a small pair of scissors or nail clippers and remove them. Now you will be able to refill it with whatever you like! 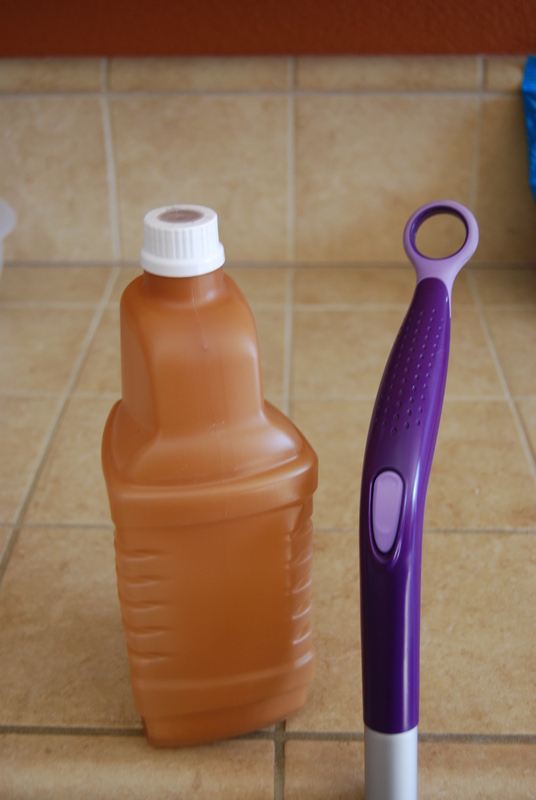 An all purpose cleaner and water, or even better vinegar and water! Now that you’ve “fixed” it, you will never have to buy another refill again. We camp a lot during the warmer months. It’s a great way to spend time with the kids and we are always doing something. Swimming, boating, hiking, playing games, playing cards, riding bikes….anything that we can do as a family and have some fun. But my favorite part of camping is sitting around the campfire. 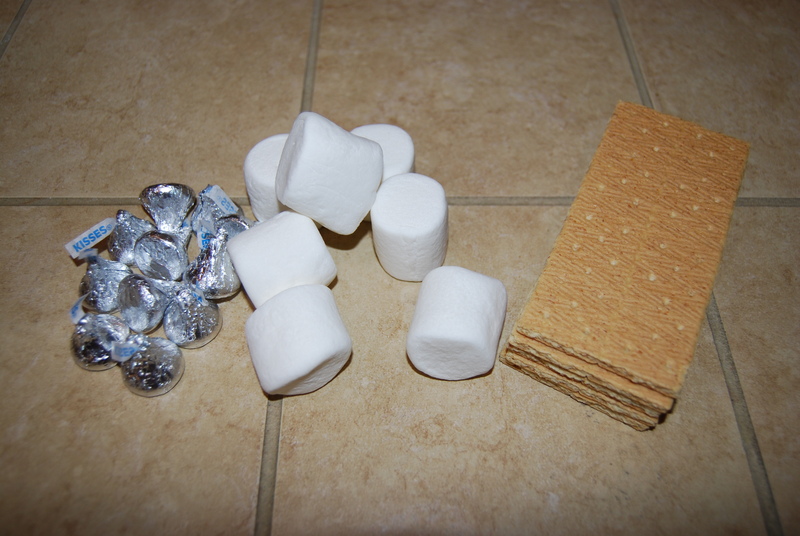 The smell, the warmth, the quiet……the smores! Most of the time, I prefer just to eat a roasted marshmallow. I like mine almost burnt on the outside and ooey-gooey on the inside. The kids love the smores. As soon as it starts getting dark they are asking when they can have smores. 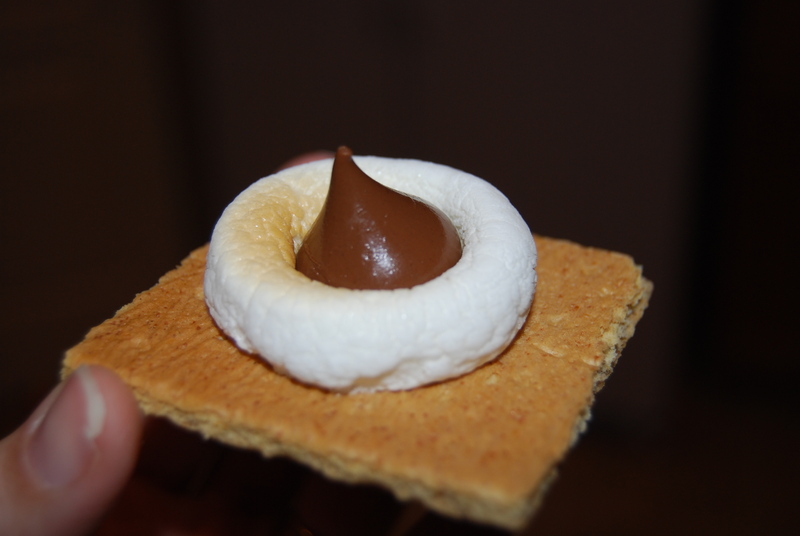 So when I saw this Pin, I wanted to try it and see if we could get smores all year round at home. You need the obvious ingredients. Graham crackers, marshmallows, and chocolate (in the form of Hershey’s kisses. Turn on your oven’s broiler to low and move the top rack up to a higher spot. I used the second from the top. 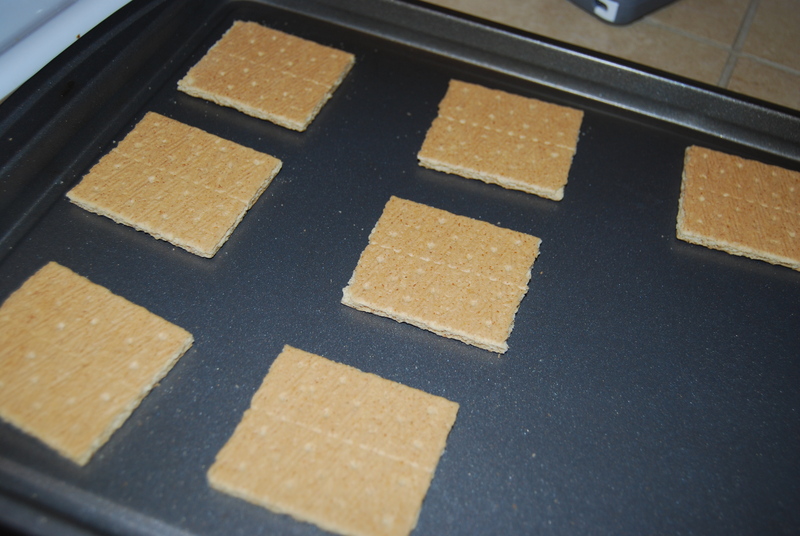 Break the graham crackers in half and put them on a cookie sheet. 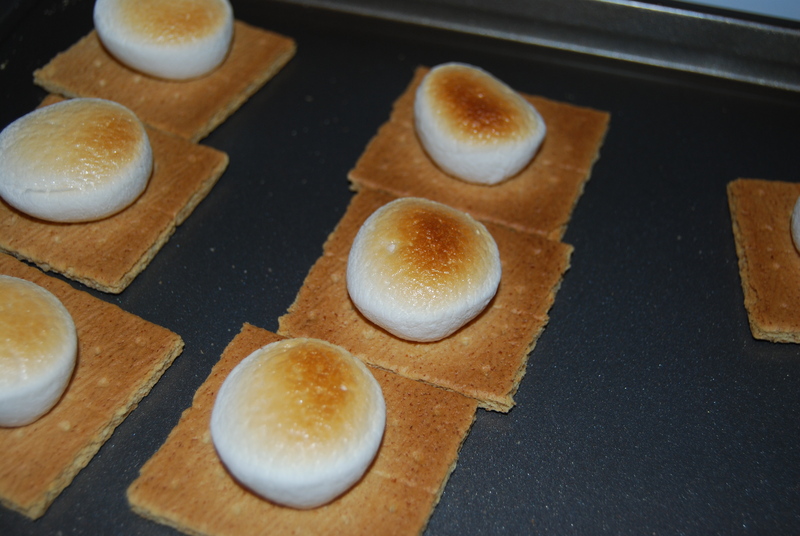 Cut the marshmallows in half and put one half on each of the graham crackers, sticky side down. Put them in the oven and do NOT walk away! They will toast really quickly. You can toast as dark as you like. We got ours a toasty brown. Take a Hershey’s kiss and push it down into the center of the marshmallow. Now here is where you can decide to either eat it as is, or go your own way. I put them back into the oven for a about 30-45 seconds to melt the kiss just a tad. Then we ate them and they were gone in about as much time. 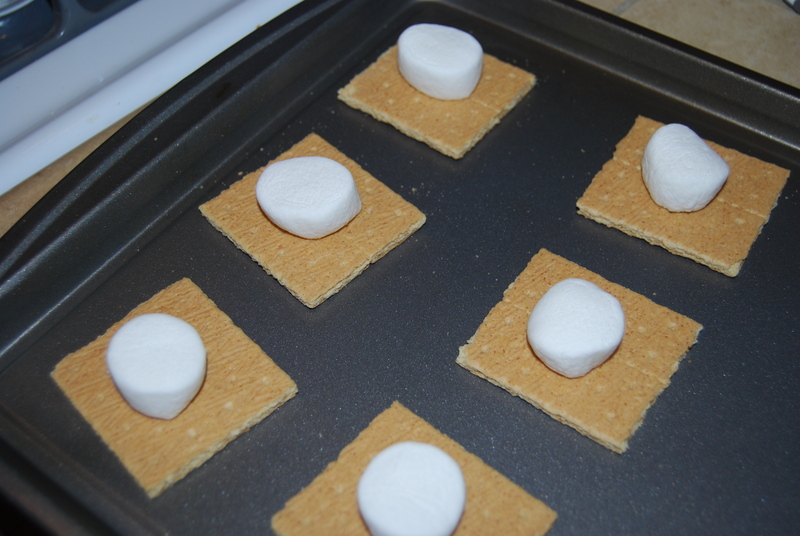 You can also put another graham cracker on top to make it more of a traditional smore, but we chose to eat them “open-faced”. Whichever way you choose to finish them off, they are a great way to get your smore fix in the middle of the winter, or any other time. 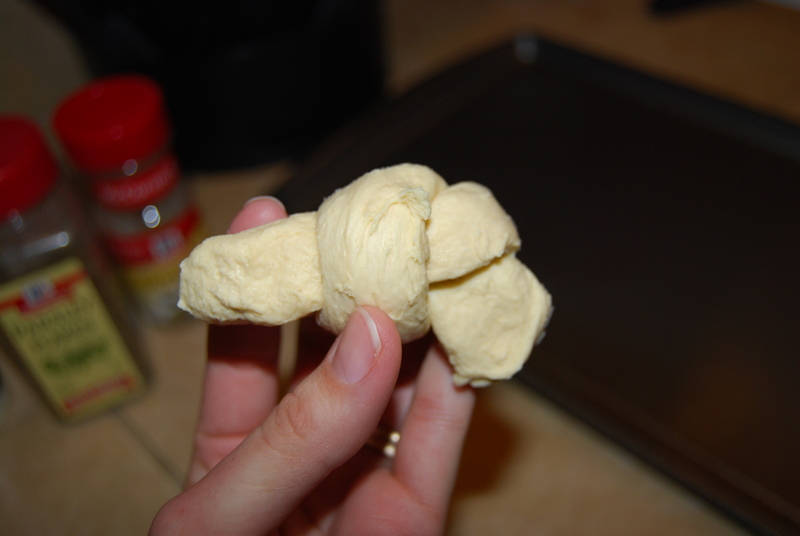 In fact, I think I’m going to make myself some right now……. 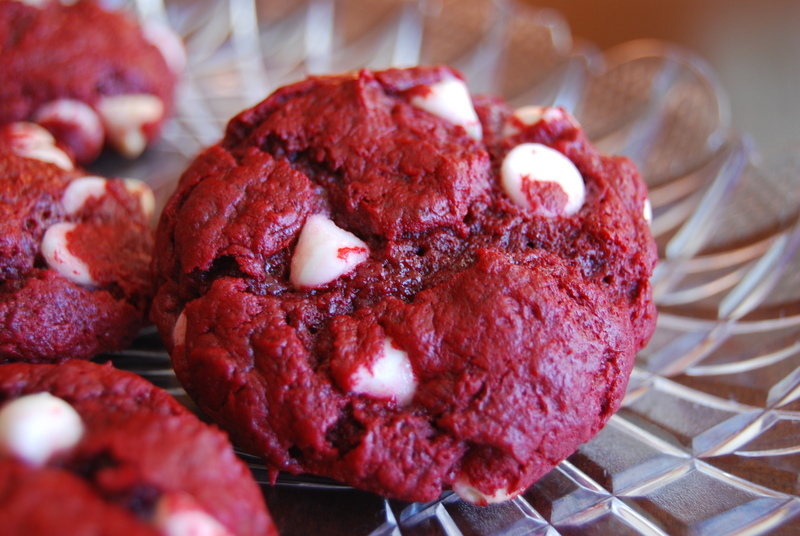 In honor of Valentines Day, here is a yummy yummy (yummy) red velvet cookie recipe. I made these over the weekend because I had to take a snack to church on Sunday. Why I always try new recipes when I have to take them somewhere, I have no idea. Maybe the pressure to make them taste good helps. These were gone so fast! 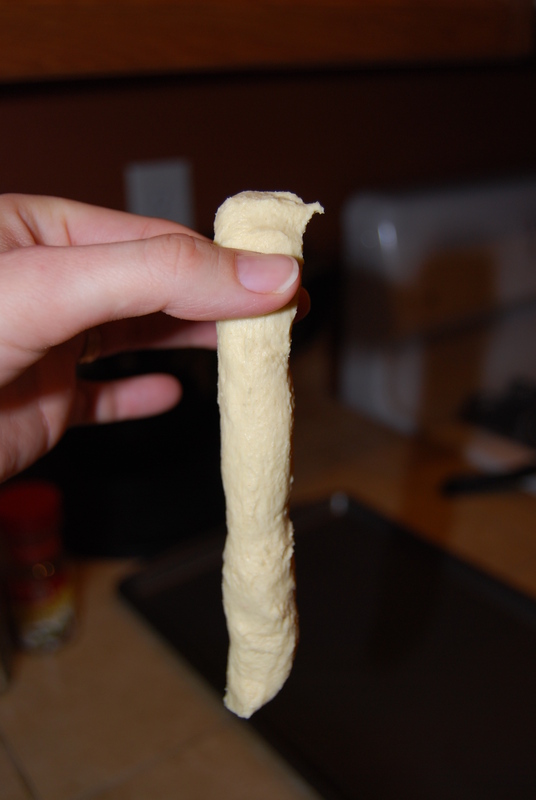 Just a note that I made a double batch, so the pictures will show double of everything. 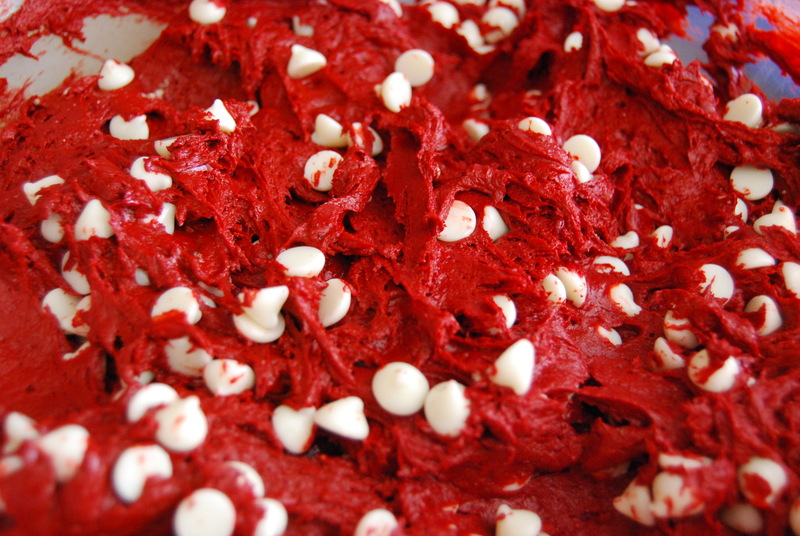 You need a box of Red Velvet cake mix, 1/2 cup or one stick of butter (at room temperature), 8 oz. 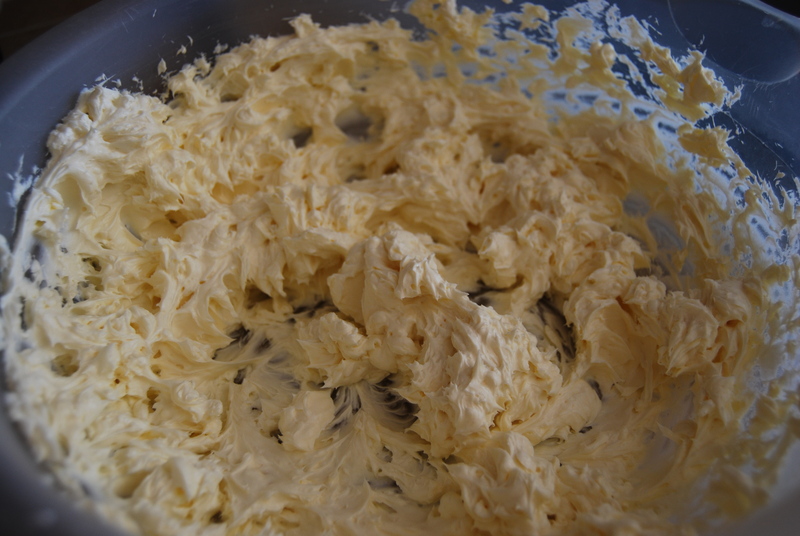 of cream cheese (at room temperature), one egg, half a bag of white chocolate chips, and a tsp of vanilla. Preheat your oven to 350. 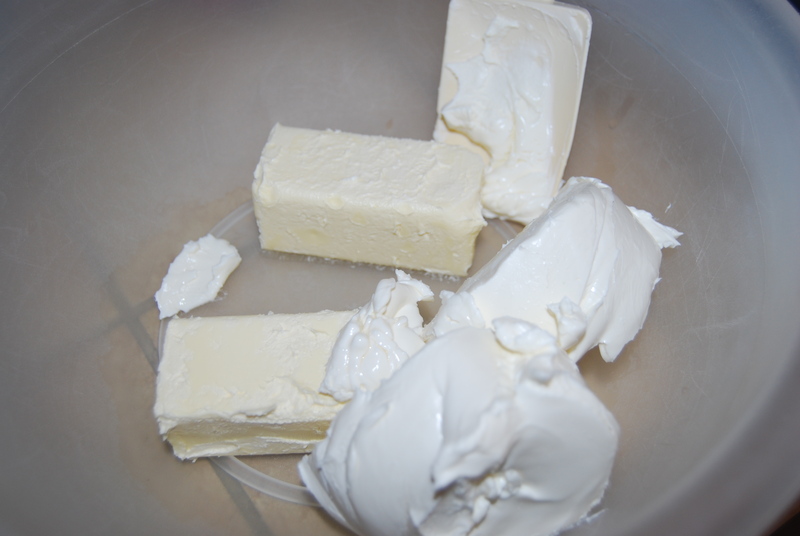 Put the butter and the cream cheese into a bowl and mix together with a mixer. How I wish I had a KitchenAid Mixer!! 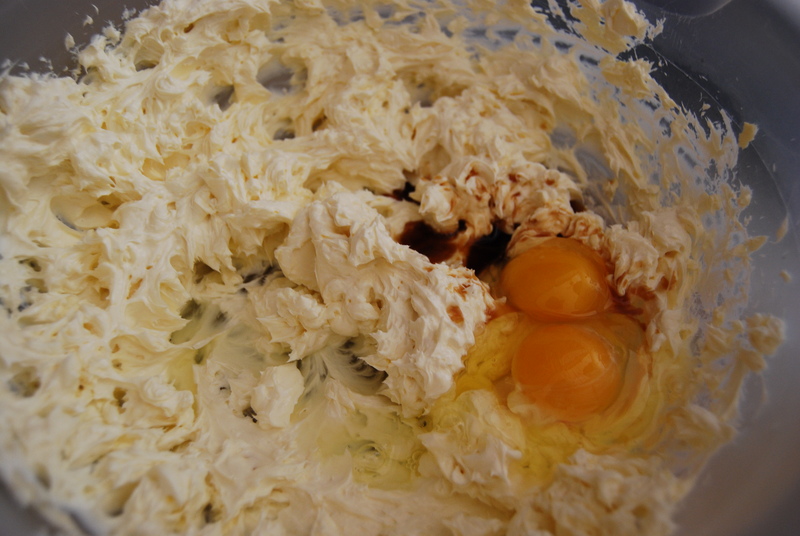 Add in one egg and 1 tsp of vanilla and mix well. Again, I did a double batch. Only add one egg. 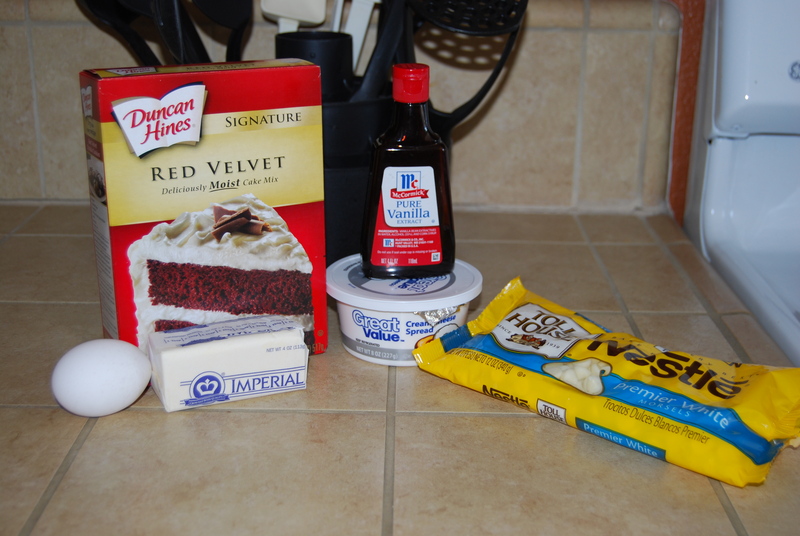 Next, mix in the package of red velvet cake mix until it is well incorporated. It starts getting thick and sticky. 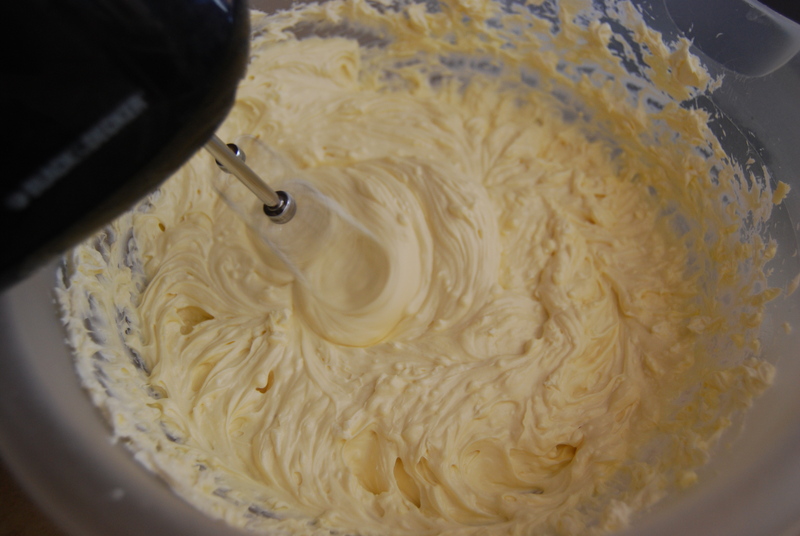 Once it’s all mixed, use a spatula to mix in the half a bag of white chocolate chips. After this, I stuck it in the fridge for a few hours to chill. It makes it much easier to roll into balls. You don’t have to do this. You can drop them on the cookie sheet from a spoon but I am a perfectionist and wanted mine to be pretty. 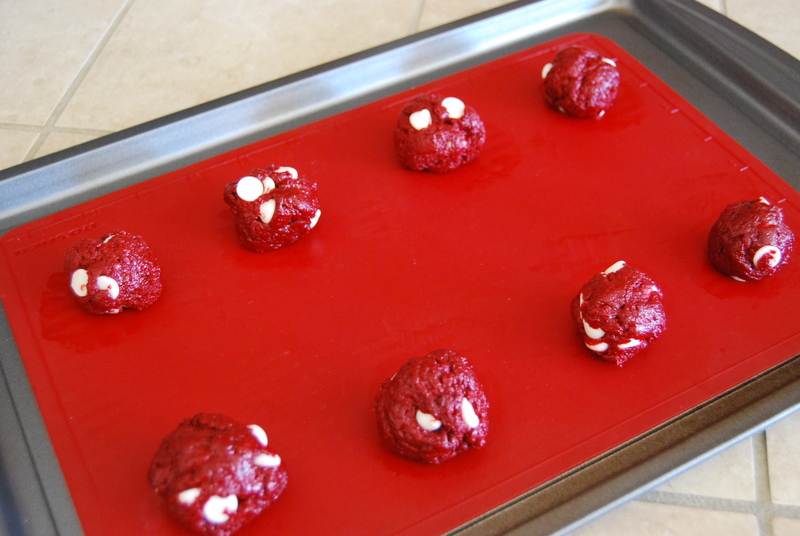 Roll them into about 1 inch balls and place on a cookie sheet. I use the rubber non-stick mats on mine. 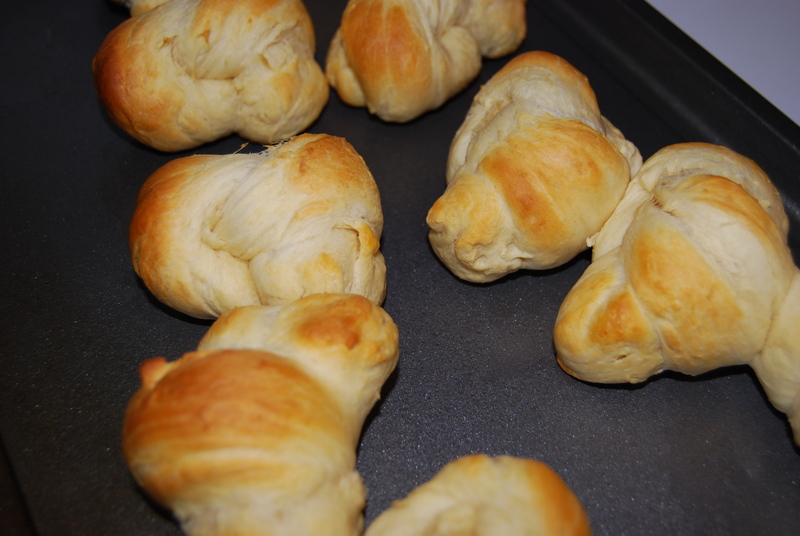 Bake them for 10-12 minutes until the outside is cooked but the inside is still soft. Place on a wire rack to cool. While they are still warm you can also push a Hershey’s kiss or hug onto the top. 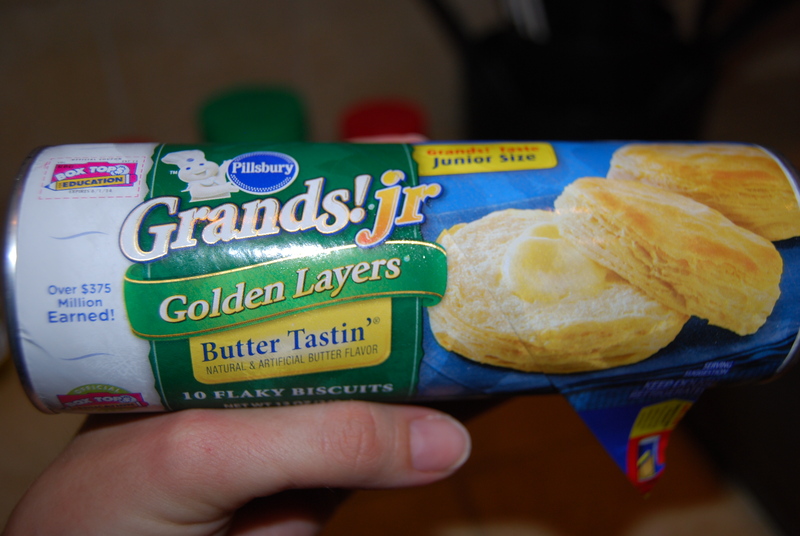 These are so soft and gooey and yummy. They would make a perfect treat for your honey or for your child’s teacher. This is going to be a quick and easy one. We eat a lot of taco’s. I thought this one would be a good way to mix it up a bit and the kids thought it was fun and pretty cool. Preheat your oven to 375. 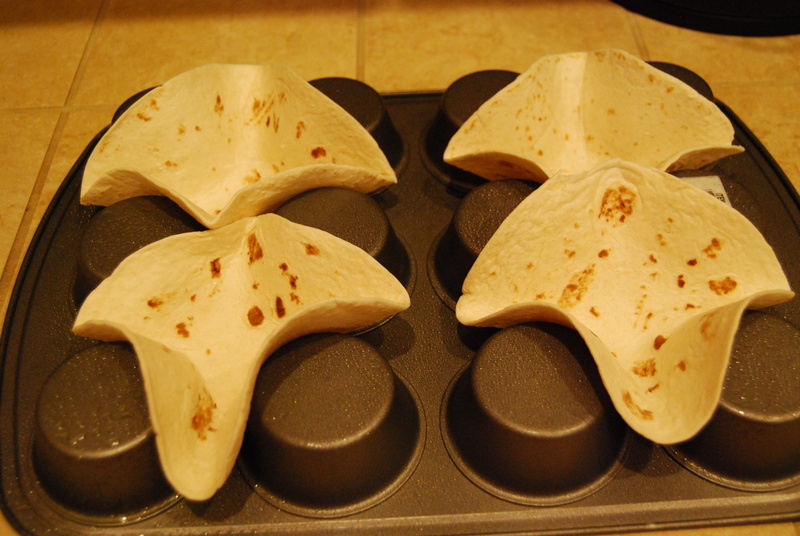 All you need is tortillas, non-stick spray, and a muffin tin. I used the smallest flour tortilla. The package said “Fajita Size”. 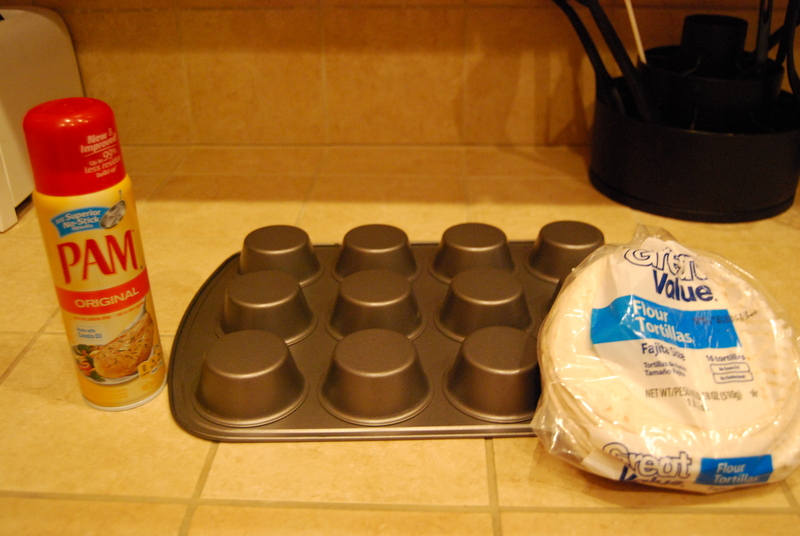 Flip the muffin tin upside down. Spray it down with non-stick spray. Nest the tortillas down into the spaces between the cups (I’m not sure what to call them..lol). I was able to get 4 onto a 12 space muffin tin. Stick them into the oven for about 10 minutes. 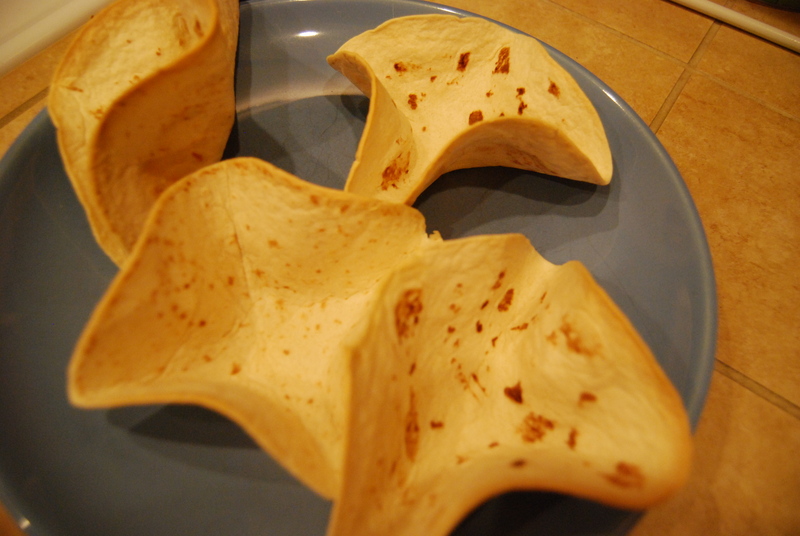 When you take them out they will be in the shape of a taco salad bowl. Fill them with everything you would put into a taco. 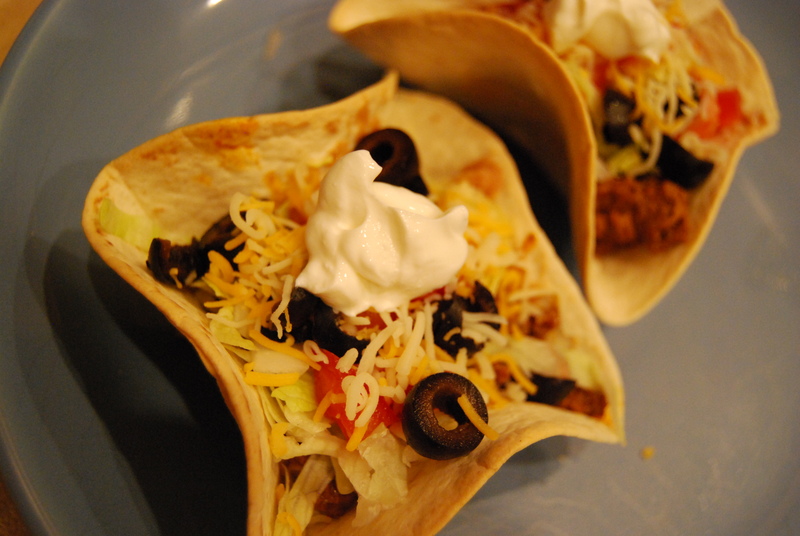 We used beans, ground beef with taco seasoning, lettuce, tomato, onion, black olives, cheese, and sour cream 🙂 Another idea is to coat the tortilla in cinnamon and sugar before you bake it and use it as a dessert bowl for ice cream or fruit! These would be perfect for a party because they are small and you can pretty much just pick them up and eat them. 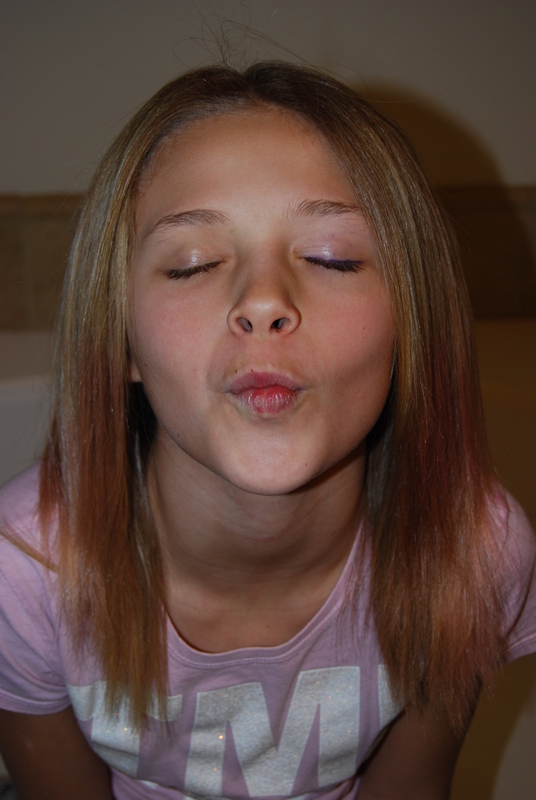 My daughter is almost 12 years old. She is just beginning to get interested in things like make-up and clothes. She has been begging me for months to dye her hair pink and I can’t bring myself to let her do an all over semi-permanent dye job. So I did some research online and this is our first experiment. To do this you need foil, food coloring, hair gel or white/clear shampoo/conditioner, an old toothbrush, and a shirt you don’t mind ruining. 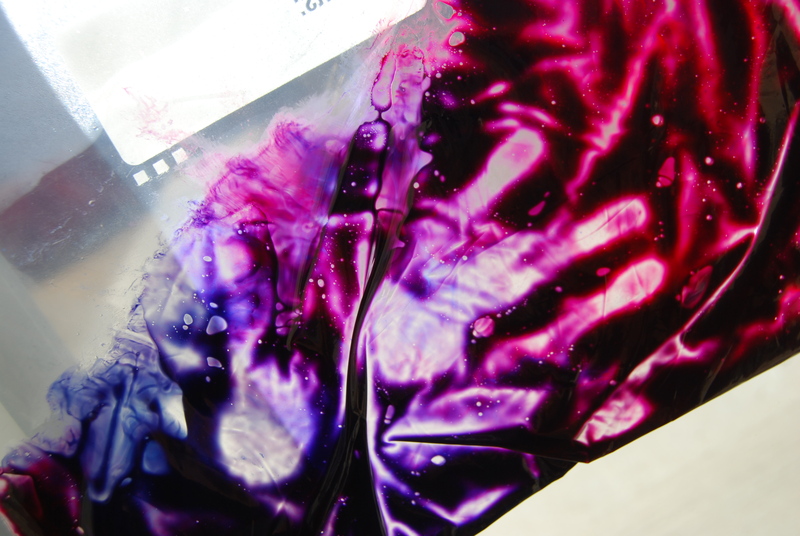 Mix a glob (that’s a technical term) of gel with food coloring to get the color you want. We were trying for purple. 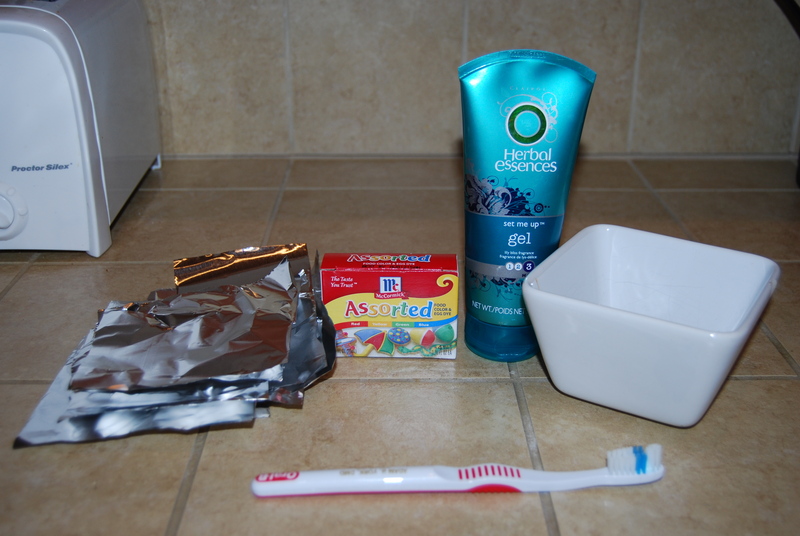 Using the foil and toothbrush, brush the dye onto the hair kind of like they do in a salon with highlights. We just went for the bottom few inches of her hair. 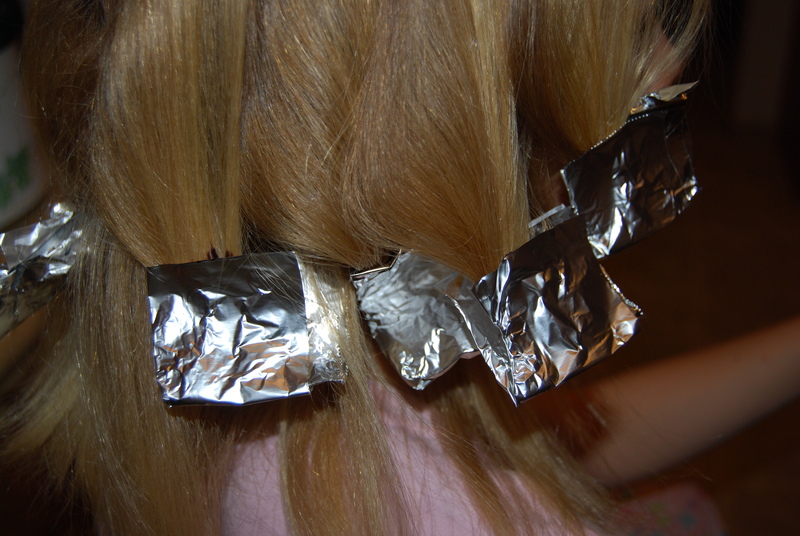 Fold the foil up and over so that it stays in the hair and covers the dye. We left hers in for about 3 hours. It was our first time and we wanted to see how it worked. 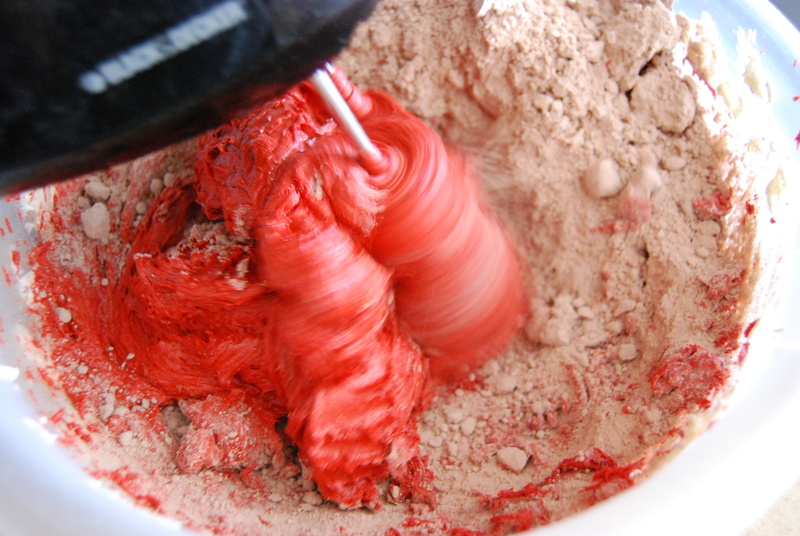 You can leave it in longer (even overnight) if you want a deeper color. 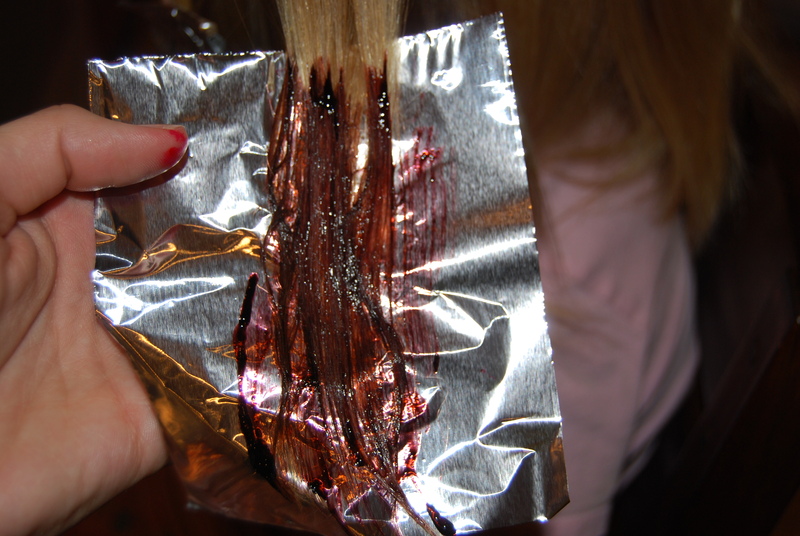 Remove the foil from the hair and rinse our the dye. No shampoo! 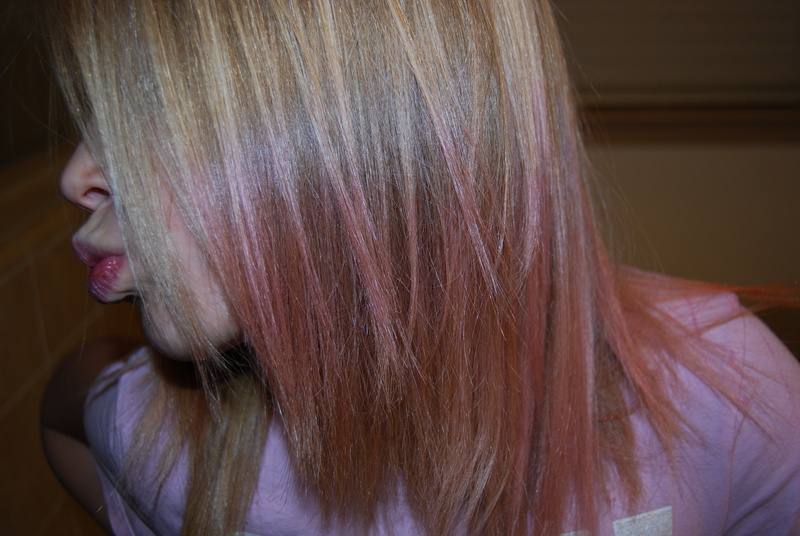 Hers turned more pink than purple but we got the result we were looking for. 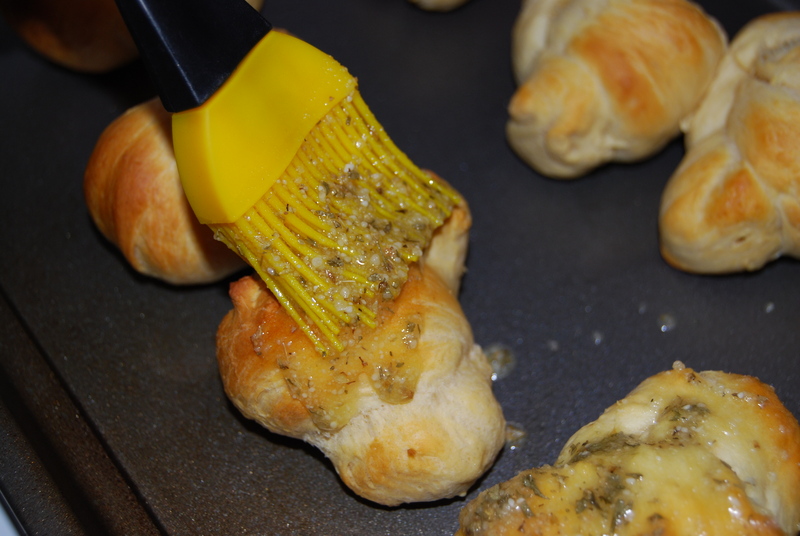 By special request of a friend, I’m going to show you how to make garlic knots. They are so easy and my family loves them. I found the recipe months ago and I make them at least once a week now. 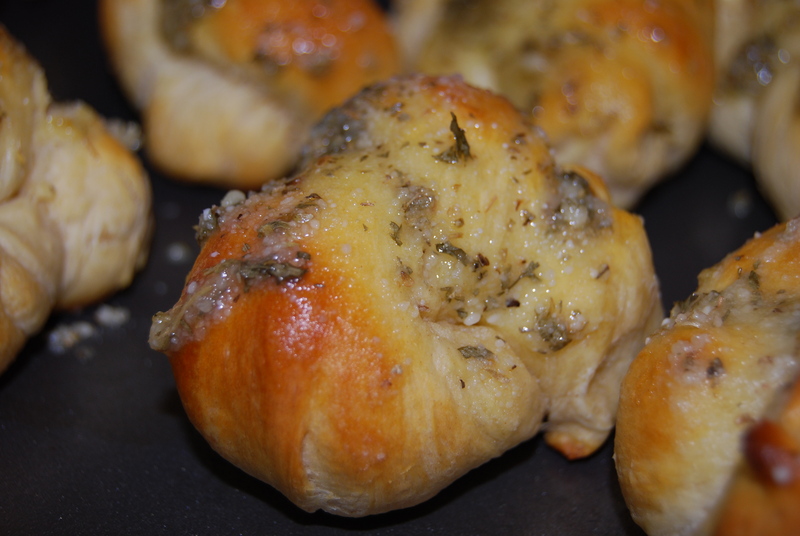 You will need biscuits, olive oil, parmesan, garlic, oregano, and parsley. 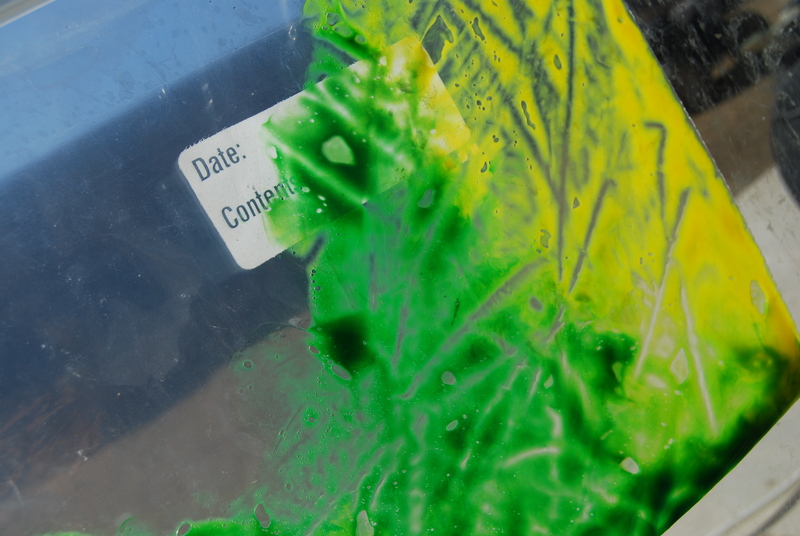 Spray a cookie sheet with non-stick spray and preheat your oven to 400. 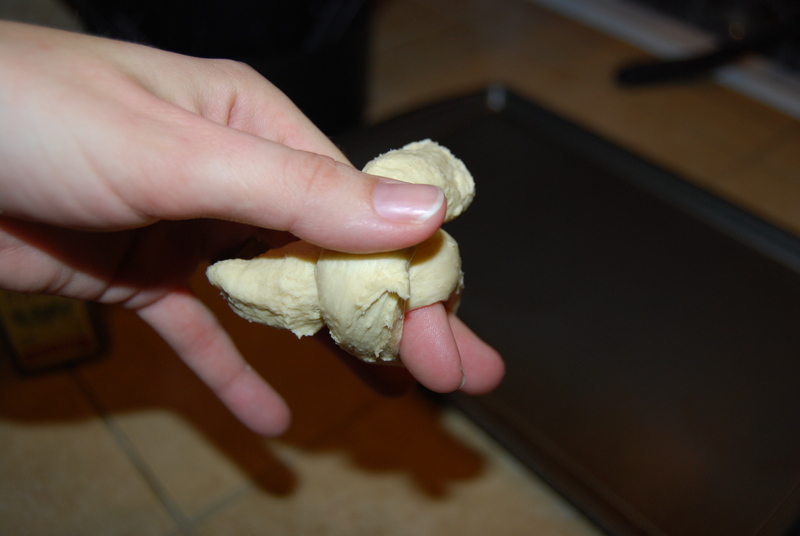 Take the biscuits out of the can and you are going to squish and roll them until the dough is a long rope, long enough to tie into knot. Then tie it into a knot. 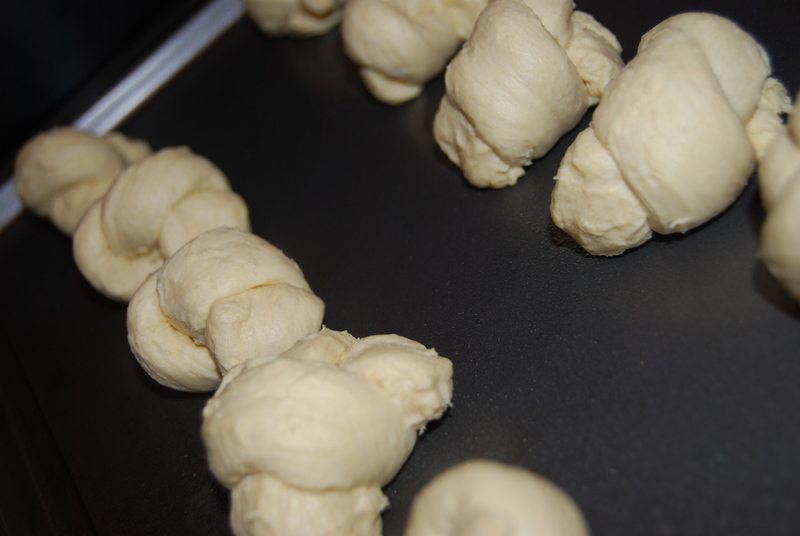 Now fold the ends under and place on the cookie sheet. Pop them in the oven and cook them for about 8-10 minutes or golden brown. 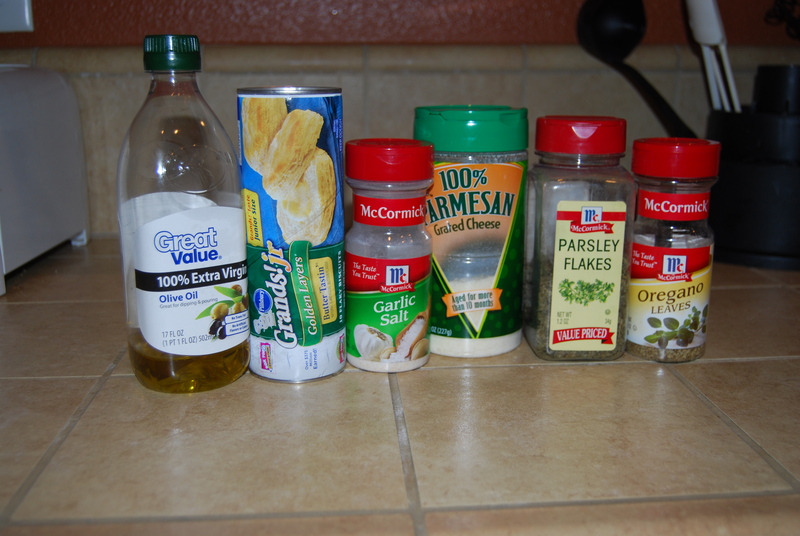 While they are cooking you will want to mix the rest of the ingredients together. 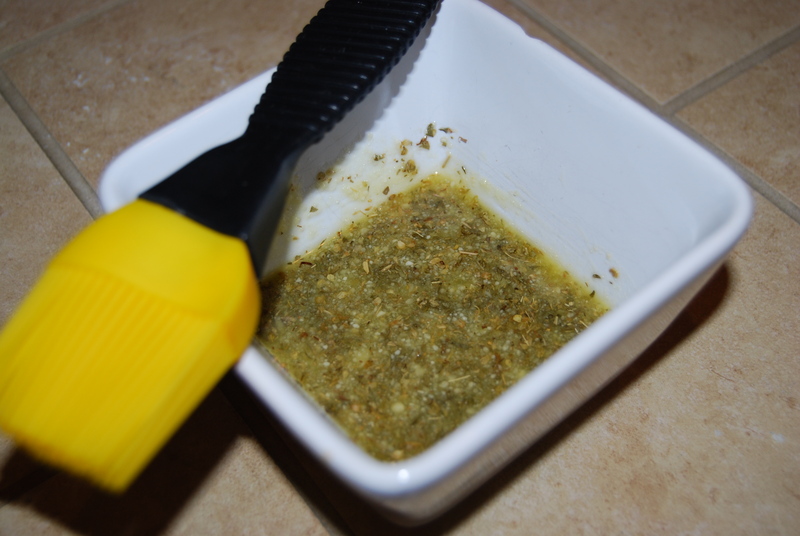 1/4 cup olive oil, 3 tbsp parmesan cheese, 1/2 tsp garlic salt or powder (I prefer garlic salt because I just like it better), 1 tsp dried oregano, and 1 tsp dried parsley flakes. 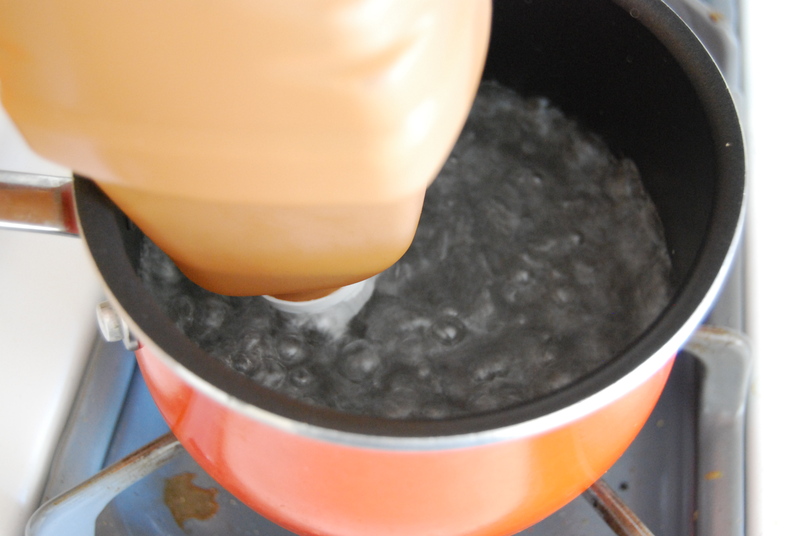 While the knots are still hot, brush the mixture over the top of them. They are going to go fast so if your family is anything like mine, you might want to make two cans 😉 Enjoy!